Book publishers, retailers and book stores use barcode generator software to efficiently keep track of volumes of books, magazines and periodicals so that it becomes easy for them to access whenever required. Barcode software is facilitated with an excellent development platform that provides assistance to craft stunning barcodes having customizable features widely admired by all book publishing companies and similarly labeling library books. For easy circulation and maintenance of books, library specific barcodes or book barcode labels are significantly utilized. Barcode generator program creates high resolution, readily printable bar code labels in no time using popular Linear and 2d barcode font standards. Barcode system is specially designed with technically advanced barcode label printing software enables to print barcodes using wide variety of print facilities. Barcode creator software uses barcode designing objects including pencil, text, line, picture, ellipse, rectangle etc to create wonderful barcodes having user desired look and versatile features. 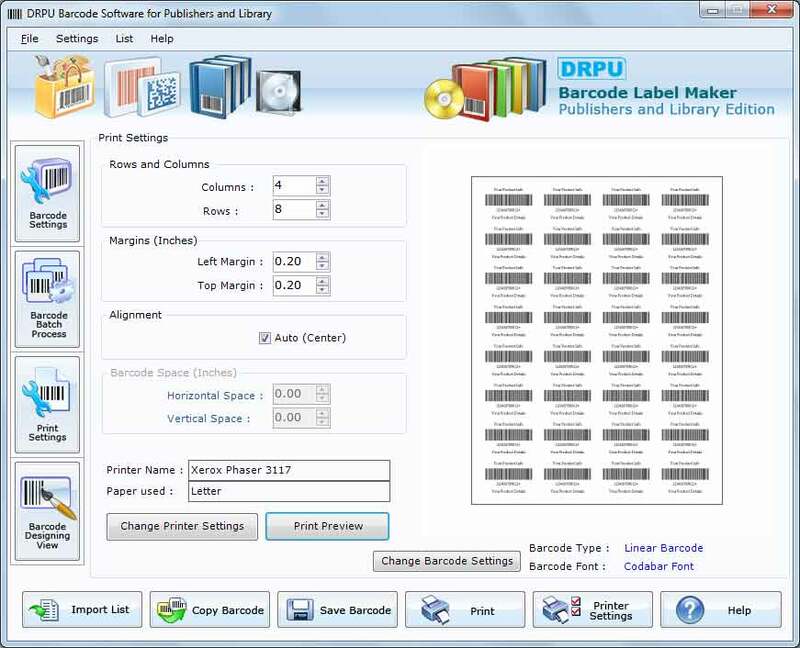 Barcode maker software generates library barcode labels and publisher barcode labels supportive linear and 2d fonts. Easily generates multiple barcodes using Sequential, Constant or Random lists generating functions. Barcode label maker software is facilitated with barcode designing view facility. Supports all library barcode scanners and printers to easily read and print generated barcodes. Provides option to save the created barcode label in any of the popular file formats (JPEG, GIF, TIFF, EXIF, BMP etc).